OH MY GOODNESS, I was just preparing my post for tomorrow's Just Add Ink Challenge, and I've come across this, which I have totally forgotten about. I started the post but never got around to finishing it. Oh dear, have a lot going on at the moment. Sorry. I stamped my Fox & Friends in Riding Hood Red, Baja Blue, So Saffron and Sahara Sand Craft Ink and embossed them using a clear pearl embossing powder that I've had in my stash for ages and absolutely love. I love how it has given them a nice, soft feel. The sentiment is from an old SAB set - one of my favourites. 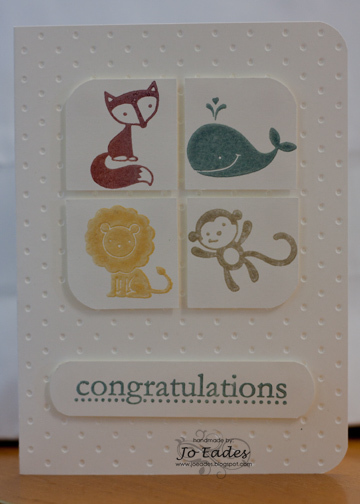 I have embossed the front of the card using my Polka dots embossing folder on the 'wrong' side so the dots are debossed rather than embossed. This is just too cute. I love Fox and Friends.